A previous series on this blog talked about the wealth of information we mediumwave DXers have for listing stations, and ways to reference it in the field. Last year about this time I bought an eReader (a Nook Color), with the idea of using it to read books and other saved documents. What I discovered was how easy it was to create customized station lists from various web sources using my laptop, then transfer them to the eReader for reference in the field when DXing. The second part in that series talked about using the eReader for displaying DX lists. After a summer's use it became apparent that a tablet computer might be an even more usable device, as it would allow better web access, more options for file reader software, and a bigger screen (10 inch vs. 7 inch). 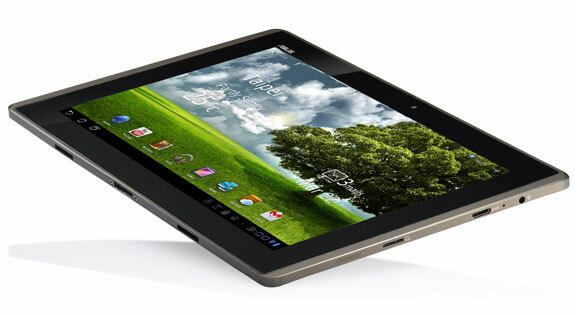 This spring I purchased an Asus Transformer TF101 Android tablet. It has been a good choice. As mentioned previously, typical station lists can be created in several forms using various web or other sources. Reader apps for tablet computers can handle .TXT (text) file format, .PDF (Adobe's Personal Document File) format, .HTML (web) format, and others - even .XLS (XCEL) spreadsheet files or comma-separated value text (.CSV) files. Three favorite web sites of mine for mining mediumwave AM data are Lee Freshwater's AM Logbook, MWList, and the FCC's AM Query. Let's review what they have to offer. AM Logbook will generate a single web page list of stations by frequency, callsign, state, city, transmitter location, and others. US and Canadian stations are represented. The page can be saved locally by your browser and transferred to your tablet through either a hard connection, WiFi, or a Cloud service like Dropbox or Box. AM Logbook also supplies its AM list in downloadable XCEL spreadsheet form. MWList, a more complicated site, attempts to document all AM stations worldwide, by country. It encourages users to register, but its data is also available to non-registered users. MWList has the ability to create a customized country file in PDF form which is then made available for your download. This is really the way to go on this site. Enter the site, login if you are a member or click "Continue as guest", then click the "Downloads" heading tab. Check off the countries desired, then download your PDF file. Transfer to your tablet as indicated above. MWList also outputs country data to a generated web page, like AM Logbook. Country data is initially displayed by frequency, but the data columns on the page can be click-sorted by location, callsign, state, etc. Data is presented in an HTML "frame" within a parent page, so saving the web page core data in this way is not as easily done. Sometimes it is necessary to break the frame out into its own window, and this is the technique that I use. Some browsers allow this option and present a right-click menu item to accomplish it. Firefox and Opera include this function. Once the frame is broken out into its own page it is easily saved as HTML. Text formatting is maintained this way. Data from both AM Logbook and MWList are based on a variety of sources, one being actual reception reports. Canadian data seems accurate for both, as it is not drawn from the FCC database. Ditto Mexico and other countries for MWList. The third option, the FCC's AM Query, can also be used to create a station reference file. US data should be highly accurate, but be suspicious of any foreign data. You would be better off with AM Logbook or MWList for Canada and Mexico or other countries. Output can be displayed as a simple web page or a text file, easily transferred to a tablet, as above. My own Radio Data MW program has the capability of creating station list files in HTML and CSV formats. I often use its files on my tablet, as I can set them up to show expected signal strengths and sunrise/sunset times for each station, something not available with any of the other sources. Much reader software (in the form of apps) is available for the tablet. Adobe Reader (free) and ezPDF Reader (less than $5) are good ones for displaying PDF format. Your tablet already has text reading software and an HTML browser, though many others are also available for free through the Google Play Store (previously known as Google Marketplace). Apple's iPad has similar software available at their App Store. An advantage to staying with the HTML format for your AM list is the tablet browser's pinch-to-zoom function. With file sizes fairly large, and long line lengths, it is advantageous to be able to zoom the text smaller and larger. Most PDF readers have the pinch-to-zoom capability, but not all work as well as the web browsers. Basic text (.TXT) reader software doesn't always have an appropriate zoom capability, or may wrap long line lengths causing confusion. HTML is the better choice here. Tablet batteries typically last 6-10 hours, more than enough for a casual afternoon or night of DXing. All tablets seem to have sound recording capability, and most have video and sound recording, both. 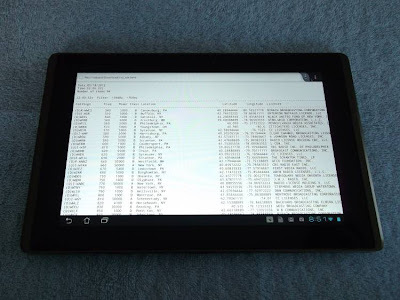 Thus your device can also be used to create a record of your DX catch for personal record or verification purposes, an added bonus to owning a tablet. Turn your tablet device into a mediumwave DXer's station reference! This is a timely post as I've been thinking of buying a tablet for this very purpose. Over the years I've tried different ways of carrying DX reference material electronically: a Palm PDA, a netbook computer, and a Kobo Touch eReader. They've all had various shortcomings. The PDA's screen was so small that it was almost impossible to display reference material in a readable manner. The Windows netbook works great, except that it radiates so much RF noise that it is unusable anywhere near a portable radio receiver. The Kobo eReader is good (it even has a web browser built in) but it has some issues that make it a bit awkward to display reference material - like the screen being just a bit too small to read PDFs comfortably. I think a 10" tablet would be a great choice, but I'm also considering two other possibilities. The first would be to get a 7" tablet or an eReader like the Kobo Vox that runs a full version of Android. These cost less than a 10" tablet and are easier to carry around. But you've got to deal with the smaller screen. The other would be to load all your DX reference materials on an Android smartphone. The small size of most smartphone screens might be a problem, but on the other hand there's nothing more portable and you're going to have your phone with you anyway, so this would eliminate the need to carry a second device. I recently got a new smartphone and this is the first thing I'm going to try. Yes, after some experimentation last summer with the Nook eReader (7 inch), I settled on a 10 inch tablet. I probably could have dealt with the 7 inch size, but I found the processor a little slow when handling large PDF or HTML files. I bought the original Asus Transformer TF101 this winter (a 10 inch), and it has been a winner for me. The speed is good, and the big screen really makes a difference. Asus has an excellent record of keeping their O/S updated. Running Ice Cream Sandwich 4.03 right now after about 4 updates issued since new. A few minor bugs for sure, but sufficient. Of course an iPad would probably do just as good a job, though I prefer Android's customization ability. ezPDF (about $5) is a good choice for a PDF reader. Adobe (free) also works well. Some of my charts are in HTML format and can be quite large if you display the entire US database. Large HTML files give difficulty to different browsers. Try all the big names - Dolphin, Opera-Mini, etc. and see how they react. Some choke on big files. Browser technology on these devices has a ways to go. I run a Yahoo Group called mwmasts. Your blog would make a perfect link to have on my Group. Please could you email me at djg2405@o2.co.uk to discuss things. My site fmscan.org also offers predictions for MW: You get a comprehensive frequecy table for any place in the world based on position, propagation (time, season) and power patterns. Transmitter maps can be customized with many options. The 24h frequency graph (single frequency menu) plots the expected development of signals over one day.